Hanoi (VNS/VNA) - Local markets were fragile on August 17 after gains in a day earlier, with both indices falling on weakening investor sentiment. The benchmark VN-Index on the HCM Stock Exchange fell 0.77 percent to close August 17's session at 767.59 points. The southern market index increased 0.33 percent in the previous session. On the Hanoi Stock Exchange, the HNX-Index also edged down 1.23 percent to end at 100.49 points. The northern market index rose 0.44 percent on August 16. Large-cap stocks continued to impact the market heavily as 24 of the 30 largest shares by market value and liquidity on the HCM Stock Exchange declined and only six advanced. Shares of most sectors were under high selling pressure, including banks, steelmakers, energy, construction and real estate companies. 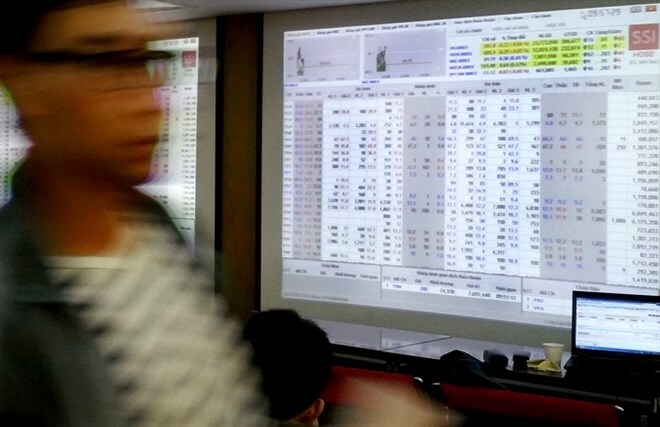 Except the Vietnam Prosperity Commercial Joint Stock Bank (VPB) which closed flat on its first trading session on August 17, all other six listed lenders on HCM City’s exchange dropped between 0.5 percent and 6.6 percent. VPBank on August 17 began to trade its entire 1.33 billion shares on the HCM Stock Exchange at a reference price of 39,000 VND (1.72 USD) a share. VPB dropped to 33,000 in the morning session but recovered and settled at 39,000 VND by the end of its first trading day, the most expensive bank share on the market. More than 58 million VPB shares were exchanged on August 17, a record for a debut, and this amount accounted for 24.4 percent of total trading volume on HCM City’s exchange on the same day. On the Hanoi bourse, only Nam Viet Bank (NVB) improved while Asia Commercial Bank (ACB) and Saigon-Hanoi Bank (SHB) dropped by more than 1 percent each. Other losers included PV Gas (GAS), Hoa Sen Group (HSG), Hoa Phat Group (HPG), Bao Viet Holdings (BVH), VinGroup (VIC), FPT Corp (FPT) and Mobile World Group (MWG). On the bright side, companies in the food-beverage sector cushioned the market. The two biggest listed stocks in this sector – Vinamilk (VNM) and brewery Sabeco (SAB) – advanced 0.9 percent and 1.7 percent, respectively. However, despite the rally of these two stocks, selling pressure in the entire market increased sharply in the second half of the afternoon session, further pushing down the indices in the final trading minutes. “This movement indicated negative sentiment of investors about the market’s short-term outlook,” market analyst Tran Duc Anh at Bao Viet Securities Co wrote in a note on August 17. According to Vietnam Investment Securities Co, the market depended heavily on some large-cap stocks while liquidity was unstable.